John Hubley, considered one of animation's most innovative and influential designer-directors, will have his life and art celebrated by the Academy of Motion Picture Arts and Sciences' Monday Nights with Oscar screening series. A special evening featuring rarely seen John Hubley movies will be held on Monday, Oct. 10, at 7 p.m. at the Academy Theater at Lighthouse International in New York City. The event will be hosted by Academy Award-winning animator John Canemaker (The Moon and the Son: An Imagined Conversation). He'll be joined onstage by one of Hubley's daughters, filmmaker Emily Hubley, and animator Michael Sporn. Hubley (1914–1977) is known primarily for two decades of film collaborations with his wife, Faith Elliott Hubley. The couple, who opened their studio in 1955, focused a number of their animated films on such subjects as the creative process, the Cold War and overpopulation. 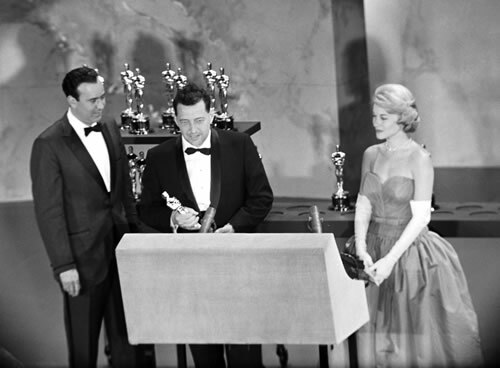 The resulting innovative work garnered many awards, including three Oscars (for Moonbird, The Hole and Herb Alpert and the Tijuana Brass Double Feature). The Hubleys' collaboration, however, represented a second blossoming of the career and life of John Hubley, who had already personified new directions in animation and a rebellion against traditional Disney studio style and content. “An Academy Salute to John Hubley” will trace the filmmaker's early training and influences, his art direction on Pinocchio and Fantasia, his involvement with the infamous 1941 strike at the Disney studio, and his innovative work on World War II training films and at the great modernist studio UPA. The films that will be shown have been provided by the Hubley family, the Museum of Modern Art, Sony Pictures and the Academy Film Archive. Tickets for “An Academy Salute to John Hubley” are $5 for the general public and $3 for Academy members and students with a valid ID. The Academy Theater is located at 111 East 59th Street (between Park and Lexington avenues) in New York City. Doors open at 6:30 p.m. For more information, visit the Academy's website or call (212) 821-9251. The Academy of Motion Picture Arts and Sciences' Monday Nights with Oscar screening series will celebrate the life and career of animator John Hubley, considered one of the most innovative and influential designer-directors in the animation field. The Hubley evening will feature rarely seen films, and a conversation with Hubley's daughter and others. The event will be held on Monday, October 10, at 7 p.m. at the Academy Theater at Lighthouse International in New York City. Pictured above are John Hubley's wife and sometime collaborator Faith Hubley, two-time Best Actress Oscar winner Olivia de Havilland, and Hubley while backstage at the 1967 Academy Awards ceremony. That year, the Hubleys won an Oscar in the Best Short Subject, Cartoons category for A Herb Alpert & the Tijuana Brass Double Feature. “An Academy Salute to John Hubley” to be held as part of the Academy of Motion Picture Arts and Sciences' Monday Nights with Oscar screening series in New York City. Hubley is considered one of animation's most innovative and influential designer-directors. 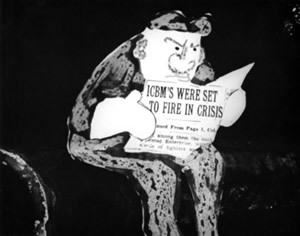 (Right: Hubley's Oscar-winning animated short The Hole .) The Hubley celebration will take place on Monday, October 10, at 7 p.m. at the Academy Theater at Lighthouse International. 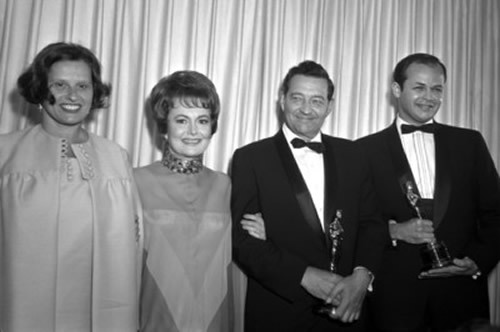 Pictured above are Hubley's wife, Faith Hubley, two-time Best Actress Academy Award winner Olivia de Havilland (To Each His Own, The Heiress), John Hubley, and Michael Goldman while backstage at the 1967 Academy Awards ceremony. 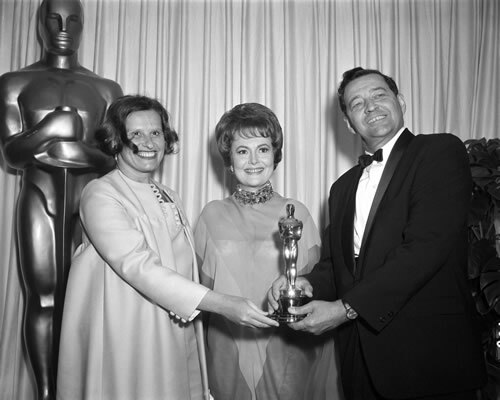 The Hubleys shared the Oscar that year for their animated short A Herb Alpert & the Tijuana Brass Double Feature. Celebrating the 50th Anniversary of Robert Wise and Jerome Robbins' West Side Story, NCM Fathom and Turner Classic Movies () will present a one-night screening of the multiple Oscar winner in movie theaters nationwide at 7:00 pm (local time) on November 9. 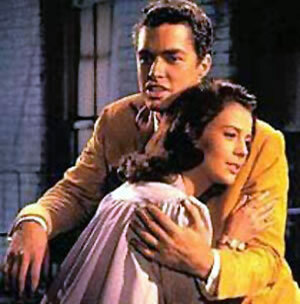 Starring Natalie Wood, Richard Beymer, Russ Tamblyn, and Academy Award winners Rita Moreno and George Chakiris, West Side Story won a total of 10 Oscars (some well-deserved; others less so), including Best Picture and Best Direction. Wood's singing voice was dubbed by Marni Nixon, who also dubbed Deborah Kerr's singing voice in The King and I and Audrey Hepburn's in My Fair Lady. As per the TCM press release, tickets will become available on Friday, October 7, via TCM.com. Go here for more information. As the Kino Lorber press release explains, back in 1981, three-time Academy Award-winning composer Giorgio Moroder (Midnight Express, Flashdance, Top Gun) began a three-year endeavor to restore Fritz Lang's 1927 sci-fi classic, Metropolis. At the time, Moroder came up with a contemporary score for the film – a decision that didn't please many – featuring “the biggest stars of the early MTV era,” among them Pat Benatar, Billy Squier, Freddie Mercury, Bonnie Tyler, Adam Ant, and Jon Anderson. The release adds that “missing footage was re-edited into the film, intertitles were removed and replaced with subtitles, and sound effects and color tinting were added, creating an all new experience … and an all-new film!” The purist in me isn't sure that's such a good thing, but it does sound intriguing all the same. 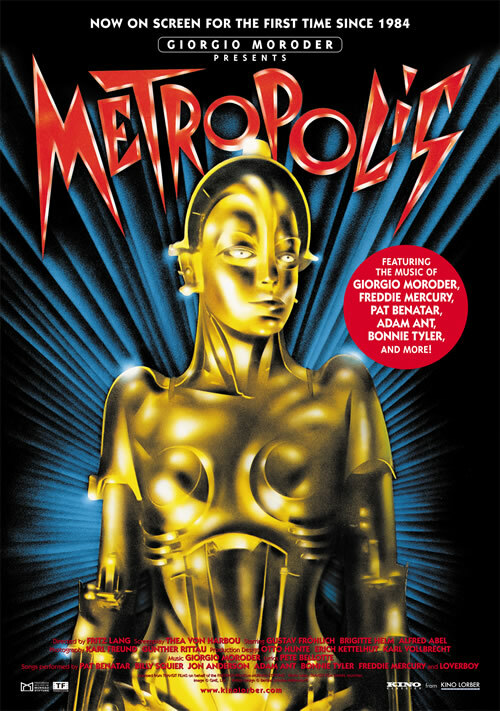 Since the mid-'80s, this version of Metropolis has remained out of print, but now Kino Lorber has come up with a new HD transfer and “is presenting the film in the best possible quality – just as it was seen in its original release in August 1984.” Brigitte Helm, Gustav Fröhlich, Alfred Abel, and Rudolf Klein-Rogge star. Lang's wife (and Klein-Rogge's former wife) Thea von Harbou wrote the screenplay. Last year, a restored (and more traditional) version of Metropolis brought in nearly 528k in North America. Not bad at all for a silent 83-year-old film that has been available on home video for decades. Beginning Oct. 7, Moroder's revamped Metropolis will be screened throughout the United States and Canada. Those in Los Angeles can catch it at Cinefamily from Oct 7-12. Those in New York City can check it out at the Landmark Sunshine Cinema on Oct 14-15. For more information and full schedule, go here. The 6th Annual Silent Film Festival at Shasta County, Calif., to be held October 21-22 at the Shasta County Arts Council's Performance Hall, will feature an eclectic group of silent movie classics. Those range from Josef von Sternberg's crime drama Underworld (1927) to Carl Theodor Dreyer's marital drama Master of the House (1925). Also: Rin Tin Tin in Clash of the Wolves, featuring Charles Farrell (who would later team up with Janet Gaynor to become one of the most popular screen couples of the late silent era/early talkie era); John Ford's ambitious Western The Iron Horse (1924), starring George O'Brien and Madge Bellamy; and the Douglas Fairbanks romantic comedy When the Clouds Roll By (1919), directed by Victor Fleming of Gone with the Wind and The Wizard of Oz fame. Attending the festival will be silent film restorationist and historian David Shepard and Bay Area Royal Jazz Society's Frederick Hodges. Check out the Shasta County Arts Council for more information. 6:00 p.m. Angora Love (1929, Laurel & Hardy). Stanley and Oliver are adopted by a runaway goat, whose noise and aroma in turn get the goat of their suspicious landlord. Attempts to bathe the smelly animal result in a waterlogged free-for-all. Pass the Gravy (1928, Max Davidson). Max Davidson plays a widower father who enjoys raising prize flowers. His neighbor, another widower father, raises prize poultry. The two families spat because the chickens are eating Max's flower seeds. In a Romeo and Juliet-like twist, the men's children decide to marry each other, and the fathers decide to hold a celebratory dinner to show no hard feelings. However, the roast chicken on the table looks very suspicious. It's a Gift (1923, Snub Pollard) Along with a Felix the Cat. A group of oil magnates are trying to think of new ways to attract business. One of them suggests that they contact the inventor Pollard, who has devised a new gasoline substitute. Pollard himself lives in a home filled with his eccentric inventions. When he gets the message from the oil company, he is excited about the opportunity to demonstrate his innovation. 7:30 p.m Underworld (1927) (Regular admission), preceded by The Musketeers of Pig Alley (1912, D.W. Griffith). Boisterous gangster kingpin Bull Weed rehabilitates his former lawyer from his alcoholic haze, but complications arise when he falls for Weed's girlfriend. 10:00 a.m. Master of the House (1925, Carl Theodor Dreyer). The story is that of a man who takes his wife for granted and does not appreciate the effort it takes to maintain a household. While his wife is resigned and browbeaten, his old nanny and wife's current friend is not and she orchestrates a plan that will force him to rethink his notions of being head of a household. 2:00 p.m. Clash of the Wolves (1925, Rin Tin Tin), preceded by Cat, Dog & Co. (1929, Our Gang). A fire in the mountains drive a wolf pack into the nearby desert where they terrorize the local residents. The leader of the wolf pack is Lobo, actually a halfbreed (Rin Tin Tin). When the pack is discovered hunting a herd of cows, a posse gives chase. Lobo leaves his pack to lead the posse away. He is injured and found by a local prospector, Dave Weston (Charles Farrell). The prospector nurses Lobo back to health and the two become close friends. 4:30 p.m. When the Clouds Roll By (1919, Douglas Fairbanks directed by Victor Fleming). This lively silent romantic comedy was the second film made by Douglas Fairbanks Sr. for the new United Artists company. Much of the film is a satiric broadside aimed at the then-innovational field of psychiatry. Wealthy young bachelor Fairbanks allows a pompous head-shrinker to influence his romantic pursuit of Greenwich Village artist Katherine Williams. There's action, athletics and laughs aplenty, topped by a terrific climactic flood sequence. The film's highlight is Fairbanks' therapy-induced dream, a triumph of special effects which is still capable of amazing audiences. 7:30 p.m. The Iron Horse (1922, John Ford). A cowboy (George O'Brien) helps his sweetheart's (Madge Bellamy) father build the first transcontinental railroad. The Iron Horse image: Shasta County Silent Film Festival.